Sturtevant, Wis. – Evinrude announced today industry-leading coverage on all new E-TEC engine purchases through its Perfect 10 Sales event. 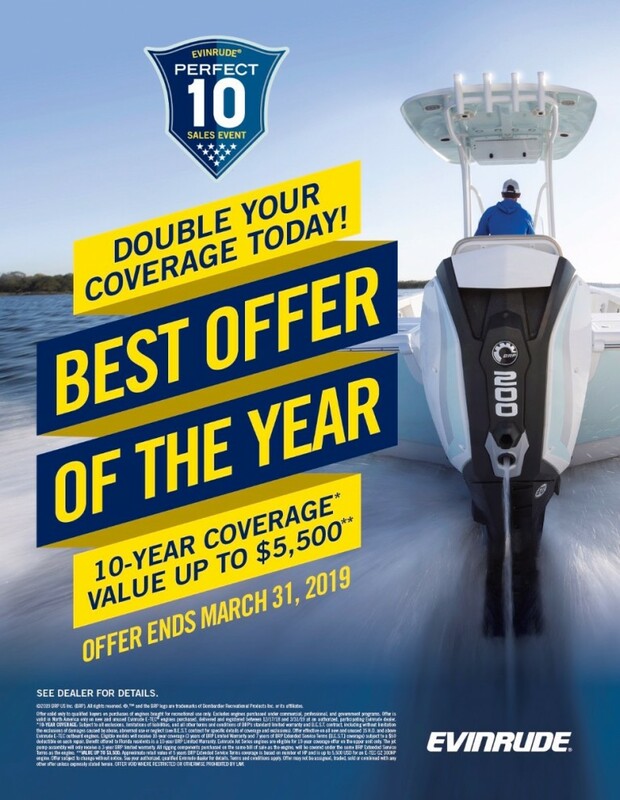 Consumers who purchase and take delivery of eligible Evinrude E-TEC engines during the Perfect 10 Sales Event will qualify for a 10-year, non-declining, 100% factory-backed extended service coverage valued at up to $5,500 (USD). Customers repowering with Evinrude E-TEC engines will receive 7-year factory backed coverage and free rigging. Purchasers of Evinrude iDock engines will be eligible to receive a $10/HP consumer rebate. All iDock units registered during this program also automatically receive 10-years of factory-backed coverage.The Perfect 10 extended service coverage offer runs through March 31, 2019. Evinrude’s engine line up, from 3.5 to 300 HP, offers customers superior value across a full range of applications, and are available at authorized Evinrude dealerships worldwide. Follow Evinrude on Facebook at www.facebook.com/brpevinrude. Evinrude, part of the BRP Marine Group, is a global manufacturer of outboard marine engines. A model of innovation, Evinrude developed the first commercially viable outboard engine in 1909. Celebrating 110 years of innovation in 2019, Evinrude’s engine line up, from 3.5 to 300 HP, offers customers superior value across a full range of applications while meeting all global emissions standards. Engines are available at authorized Evinrude dealerships worldwide. For more information visit http://www.evinrude.com.